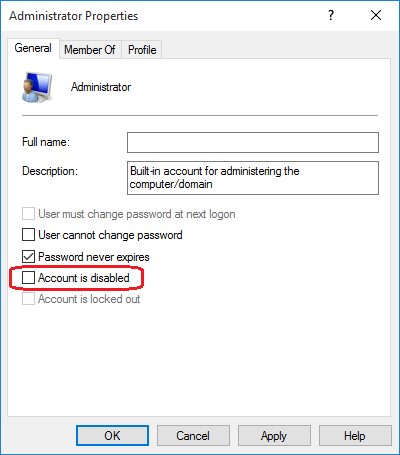 The built-in Administrator account is hidden & disabled by default in Windows. 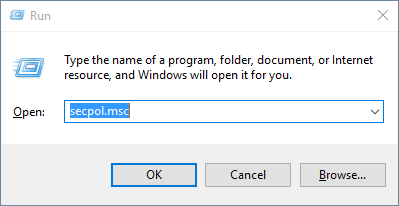 There is always a built-in Administrator account associated for every Windows installations. It’s a super administrator account that gives you some extra privileges over the normal administrator account. 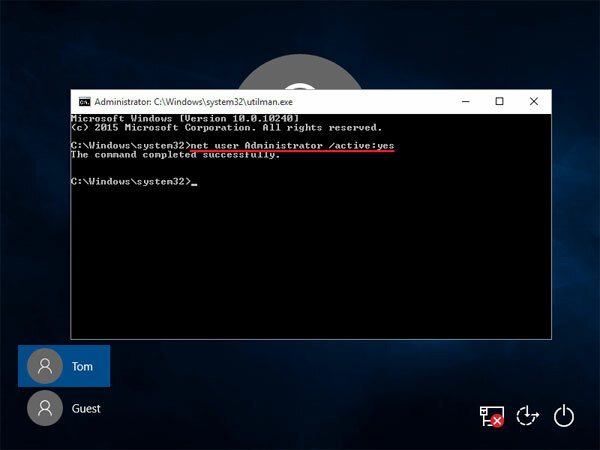 In this tutorial we’ll show you 4 ways to enable the built-in Administrator on Windows 10 / 8. 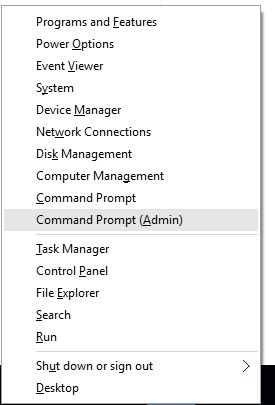 Press the Windows key + X to open the Quick Access menu, and then select Command Prompt (Admin). As soon as you execute the command, the super built-in Administrator account is enabled, and you can access it by switching the accounts. After opening the File Explorer, right-click on “This PC” (or “This Computer”) on the left navigation pane, and then select Manage. 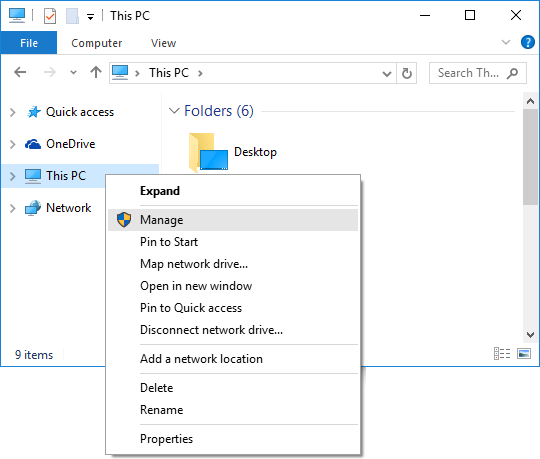 When the Computer Management window opens, expand System Tools > Local Users and Groups > Users. In right-side pane double-click on Administrator account. It’ll open its Properties window. Uncheck the “Account is disabled” option. Press Windows key + R to open the Run box. Type secpol.msc and hit Enter. When the Local Security Policy window opens, expand Local Policies > Security Options. 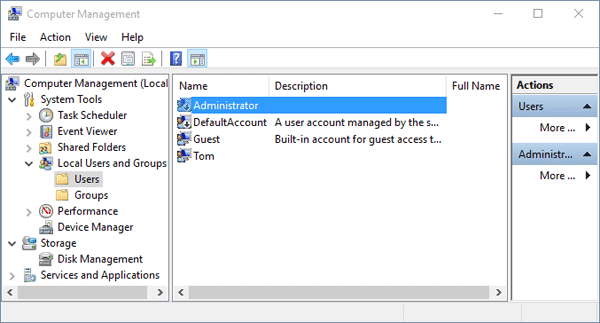 In right-side pane, double-click on the policy “Accounts: Administrator account status” and set it to Enabled. Note: Local Security Policy Editor is not available on home editions of Windows. Boot your problematic computer from Windows 10 or 8 installation DVD. 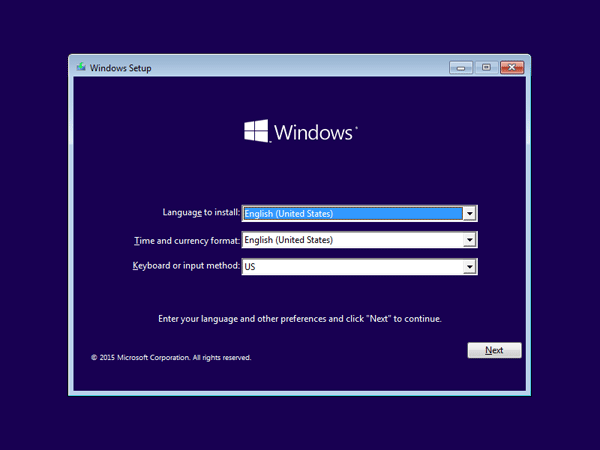 Make sure that your PC’s BIOS (UEFI) Setup is configured to boot from a DVD and that UEFI and Secure Boot are disabled. After booting into the DVD media, you’ll see the Windows Setup screen. Just press SHIFT + F10 to open a Command Prompt. 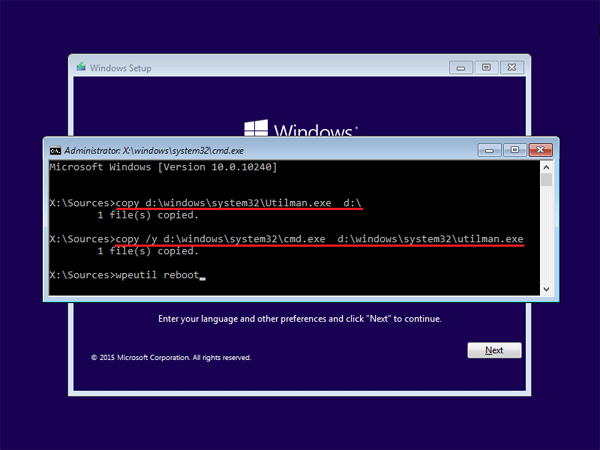 In the Command Prompt, type the following commands one by one, press Enter after each. That will make a copy of the utilman.exe file, and then replace utilman.exe with cmd.exe. In most cases, Windows 10 or 8 is located on drive d:\. If that’s not your case, make sure you replace d:\ with the drive letter of the partition where Windows 10/8 is installed. Now type wpeutil reboot and hit Enter to reboot your computer. Eject the DVD media and let your computer boot from local hard drive. Wait until Windows boots to the login screen. Click the Ease of Access button in the lower-left corner of your screen. Since we replaced the utilman.exe with cmd.exe, a Command Prompt should open now. Close the Command Prompt and reboot your computer. 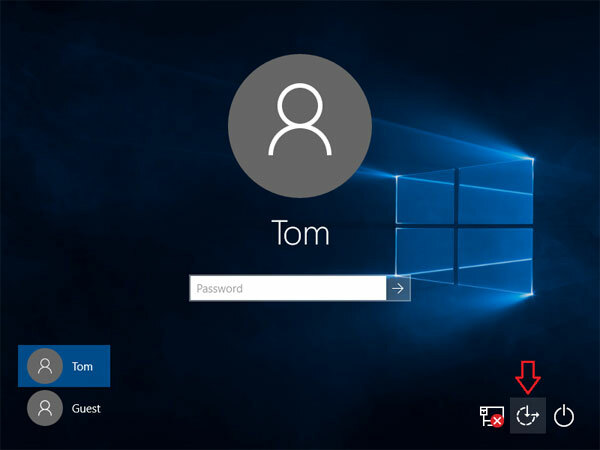 You can sign in to Windows 10/8 with the newly activated Administrator account.